Which quality is most complimentary to the feminine: BRAWN or BRAINS? Has science finally usurped warcraft in this modern age? Are we more attracted to intelligence or physical perfection? 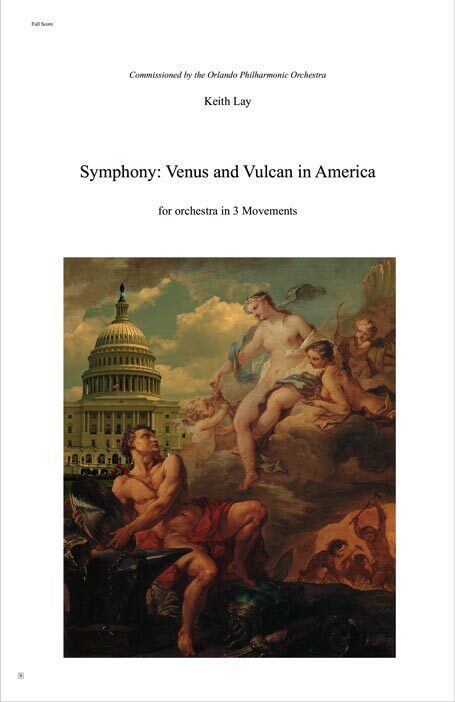 These are the program subjects of “Venus and Vulcan in America” for orchestra. 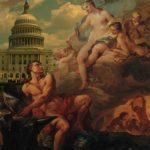 “Venus and Vulcan in America” invites every listener to and imagine their own “movie” of the original myth and my amendments, made by attaching the emotions felt from the music to the plot. Audiences synchronize the plot to the music with 14 subsection titles projected above the orchestra. With you-tube, audiences read them in the video. My desire is that everyone connects with this intimate story through sympathizing with the gods’s situations with their own, similar experiences. Vulcan represented fire, metalworking, stone and sculpture – the ancient versions of the Applied Sciences. Admired by the other gods for his skills, knowledge, even temperament, and his gift of forging their weapons, Vulcan was the only god that was not perfectly formed. Some accounts claim he was ugly and deformed. Men like Vulcan were not high on the social order in ancient times. Venus, the Goddess of beauty, love and sexuality became his wife – because their marriage was forced by Zeus. Vulcan loved Venus and supplied her with a great mansion and all that she might want. But, Venus’ eye, and eventually, heart, caught the striking image and world of Mars – the God of War. Vulcan was heartbroken when learning of Venus’ secret love with Mars and proved her infidelity by exposing them in his bed within a magical net he contrived for that purpose. The myth suggests that Love finds War more attractive than Craft. In the Greek and Roman world, stability was provided through superior fighting power. Has our world changed since Roman times to where reason and understanding have made wars unnecessary? Scientific Endeavor (Vulcan), has transformed the world over these last millenia. And in the last 50 years the pace of discovery and understanding has exploded. This is because scientists, who have traditionally shared their achievements only with others of the same discipline, find advantages in collaborating with those outside their fields to solve complex issues. Astronomy, biology, physics, biochemistry, economics, sociology, psychology and so on, have merged and split into whole new scientific fields. Though Mars has determined governments, religions, and divided the rich and poor, Vulcan has provided health, food, transportation, information and mobile phones. 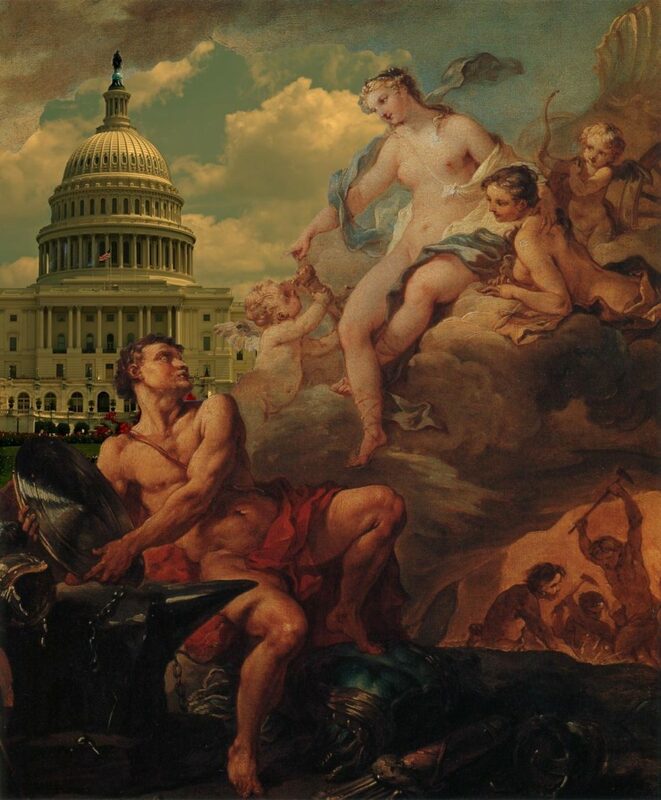 In “Venus and Vulcan in America”, Venus finds Vulcan more attractive than Mars. This exploration of the relationship of life, sceince and war were inspired by my teacher, composer Pauline Oliveros and the book Presence, by Peter Senge, Joseph Jaworski, C. Otto Scharmer and Betty Sue Flowers. Both speak of interconnectedness as key to transformation. I was told what my orchestra’s instrumentation would be (Full Orchestra including piccolo, bass clarinet, celeste, 3 percussionists (performed with 6) including keyboard, sub-bass synthesizer(my request) and percussion) in November and delivered parts in late January 2016, just a few months after receiving the commission. V+V-in-A begs for a last, fourth movement! i. Fanfare for Venus, Vulcan and Mars. The most obvious thematic idea in “Venus and Vulcan In America” is from the Tannhauser, heard just before: the downward E major scale broken into bowed pairs: 8-7 7-6 6-5 5-4 and so on. The link with Wagner, a requirement of the commission, was as deliberate as possible. The powerful Emajor chord ending that work also became the first sound of “Venus and Vulcan In America”. 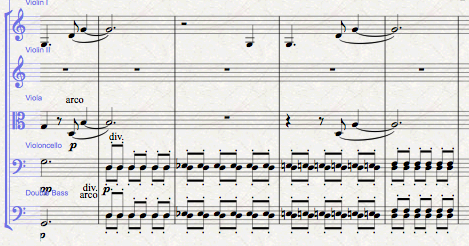 The two neighbor-tone bowed/slurred pairs will provide motivation throughout the first movement, diminished to sets of 16th note repeating pairs by rehearsal letter F.
The fanfare was originally written for brass in my high school years, called “Fanfayre”. It fit the need for boldness and simplicity. ii. Zeus Rewards Vulcan with Venus’ Hand. Venus, as the most beautiful, desired woman, ever, would have every male suitor at her beck and call. But, her father, Zeus (King of the Gods) forces her to marry Vulcan, who is much older, imperfect of body, but generous of mind and spirit. First heard in bar 32 in the horns and bassoons, Venus’s despair is represented in the leaps of minor 7ths in minor tonalities throughout the first movement. Theme 3a, b and c are “Venus” themes. 3a originally began as a series of three rising semitones. Towards the end of the compositional process I modified the last m2 move upward to a m9 interval upward to make it more obvious. 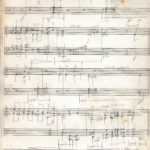 I needed a more reliably obvious leitmotif to be used throughout the piece to tie into the first movement – and the m9 allowed it to be done with just two notes. iii. Absorbed in Work, Vulcan Forgets His Wife. Without Vulcan noticing, Venus’s theme is heard in the oboe and solo trumpet. Then, Venus, the most beautiful and sensual goddess, just becomes herself with alluring upward sweeps that almost become almost Hollywood in their close, voluptuous harmonies. The intensity increases as the heat between Venus and Mars enflames. Mars’ trumpet fanfare theme of an upward P4th matched at the tritone with the horns. The tritone leaps reveal his dangerous nature and quote Gustav Holst’s “Mars” theme. The couple’s themes move headlong into a furious climax. The horns rip and trombones gliss upward to their high registers at the same time that the subwoofer dives down into the low 30Hz range. Vulcan, informed of his wife’s adultery, creates an invisible net to trap Mars and his wife in the act. The music is powered by a mixture of the v. Venus With Mars (incredulousness) and his own theme from iii. Absorbed In His Work, Vulcan Forgets His Wife (intellect and empathy). He lies to Venus that he’s off to do business and will be leaving, sets his trap, and as feared, Venus and Mars are again in their bed. Much like the previous “Venus With Mars” music, but before they reach the climax, Vulcan’s trap freezes them in the magic net. Vulcan has requested that all the gods of Olympus see them with their own eyes so that Vulcan cannot be doubted in his claim. The energy quickly dies down and Venus cries. The Orlando Philharmonic’s Concertmaster, Rimma Bergeron-Langlois captures the Venus’ minor 9th theme beautifully this brief solo. Venus’ emotions are sadness and grief. She grieves that she has allowed herself to be so impassioned, and the feeling of being so exposed and publicly humiliated.Venus grieves being unable to choose her own husband, and what she’s done to Vulcan, who loves her. The music expands on Venus’ despair over her loss of choice that was heard in bar 34, each phrase complimented with upward moving “Tannhauser pairs” in the winds. After the public humiliation and Vulcan’s wrath, I imagined that the two have to sort things out with some kind of settlement, since they are to live together. I suggest that, with it all out on the table and nothing to lose, they speak their truths to each other. This catharsis brings them closer together because they each feel heard by the other. The music builds in intensity from viii. Venus’ Despair to a climax using the bowed pairs heard throughout. To suggest earnestness on Venus’ part, I mix Venus and Vulcans theme’s again, this time in the strings. The woodwinds dance around the phrases happily, almost Disneyesque. But the music, though showing promise, has too much activity. The themes are too rushed and the music doesn’t quite settle. 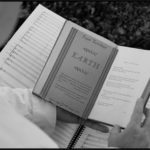 Venus’ and Vulcan’s themes together in the strings, with reactions from the woodwinds. Who knows how much time has passed, but, at some point, Venus is reminded of Mars. Her heart can’t lie, and she falls into a dark reverie with the knowledge that she is forbidden to see him. The music combines a simple, slowed version of the Fanfare in the strings and a return to Venus’ Despair. Vulcan, from this point on represented by a solo trombone for the rest of the work, plays Venus’ theme in the last bars of the first movement. The golden, high register of the principal trombone, premiered by Jeff Thomas, is Vulcan calling to Venus, while a solo violin and the woodwinds play Venus’ despair. Sadness all around is the end of the original story, representing many aspects of contemporary life: feminine vs. masculine, love vs. duty, emotion vs. reason. This movement is meant to portray the human journey of deep despair resulting from the full comprehension of our failings, the surrender to what is, opening to an epiphany of the possibilities and finally actively engaging in a new direction. Breaking from the traditional myth and moving towards my Revenge of the Nerds update, Venus realizes that she loves Vulcan and finds great peace in that realization. 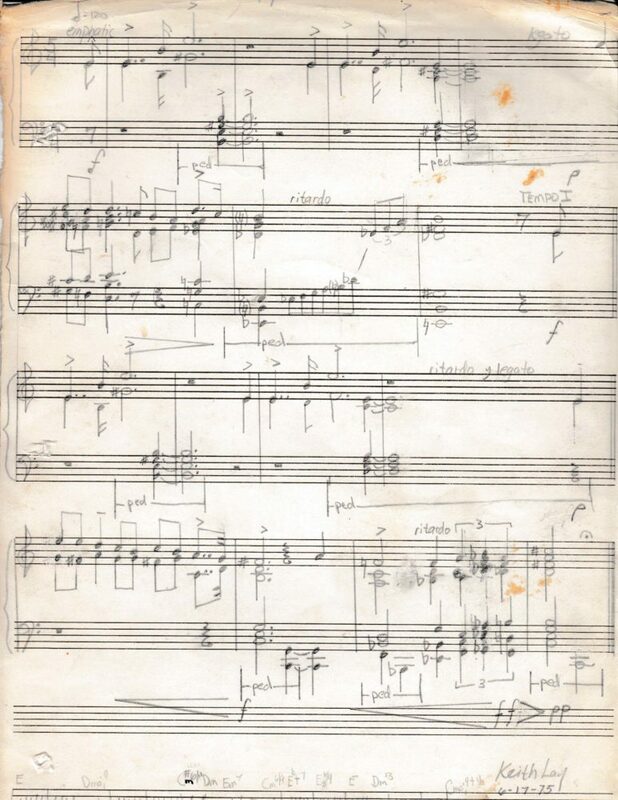 It begins with a quiet pyramid of dissonant harmony built of multiple, overlapping statements of Venus’ gesture (upward, portamenti minor 9th) in the muted strings and harp. A high bassoon solo (for principal bassoonist Diane Bishop) sings a tense, chromatic melody and together all of the voices find some repose. But not enough. Her sadness is not quenched with a single phrase. 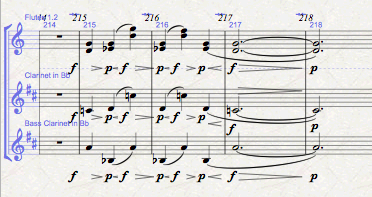 Again, the woodwinds build the dissonant texture and the solo horn (for principal Mark Fischer) further explores the bassoon melody by inverting its elements into an arch. The despair is violently disrupted by the memory of Mars with a trumpet restatement (by William Cooper) of the Mars tritone fanfare of the first movement and a drum roll, leading to the first section of flowing meter. Using the dark, lowest orchestral ranges with extreme depths of synthesized sine waves and bass drum and the pounding timpani, Venus falls into her darkest depths. The flowing meter is a constant change in tempo: 4 bars of accelerando to quarter=90 bpm followed by two bars of ritardando back to the original quarter note = 58. The strings reenter the dissonant texture, this time with a clarinet solo that explores the Venus leap @ C (1:40), beautifully played by Nikolay Blagov, coming to a more sufficient resolution. Again we fall into the depths of depression with a flowing meter. 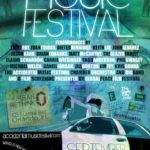 But, this time, at about midway @ bar 74 2:30, Venus has an epiphany: she realizes what she has in her husband and finds the relationship empowering, the music building to a great climax on a major dominant chord @ bar 90. What follows is a delicate and beautiful passage in the muted strings, breathtakingly rendered by conductor Eric Jacobsen. Zeus, portrayed by solo trombonist Jeff Thomas, as in the first movement, responds with a call to Venus with her motif in the instrument’s golden high register. And with a sigh of contentment in the final phrases Venus and Vulcan come together in a sweet embrace. I’ve been experimenting with a concept of irregular meter over the last several years that I call “Flowing Meter”. 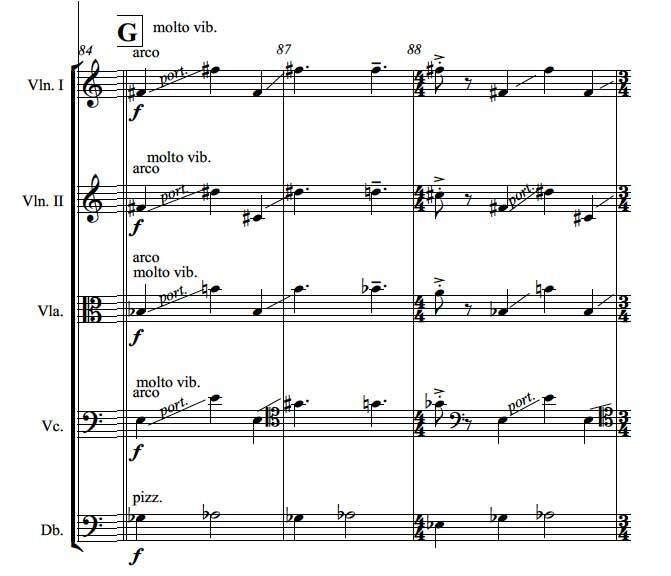 Musicians perform normally notated music with a tempo that regularly speeds up and slows down. 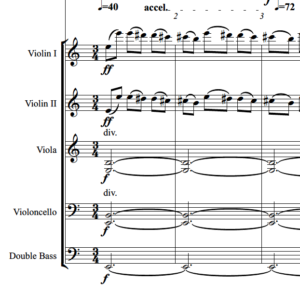 The concept is described in “Three Studies in Flowing Meter” for Clarinet Quartet. 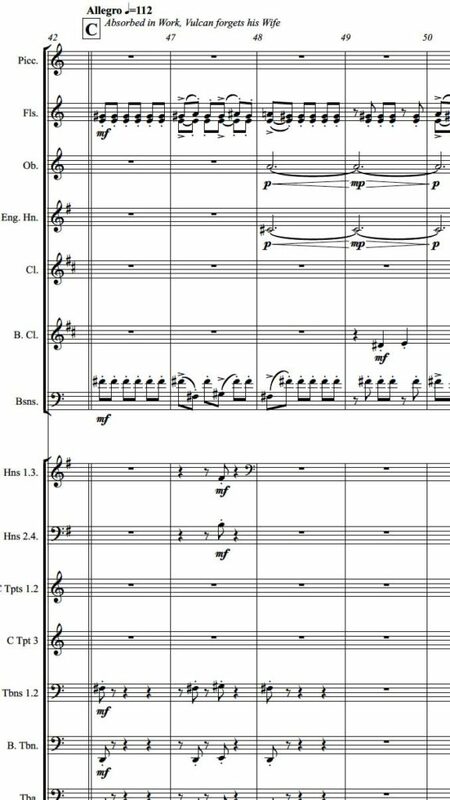 In 2015 I was commissioned by the Stow Orchestra to write a piece, and with “The Joy of Mindfulness” I was able to compose a flowing meter work with a conducted group. It worked very well. I re-used a sizable chunk of the flowing-meter portion of that piece for this movement. I only had a few months to compose this work and had no reservations about borrowing raw materials from my own catalog, as I did in the previous movement. This third movement is based solidly on a the 2nd movement of a work for Trumpet and Piano Quartet I’d written for Benoit Glazer and his family called “The Glazer Suite”. The atmosphere of this work is light and playful to represent a joyful marriage – fit for gods. It is the most traditional of the movements, much like a scherzo movement in a traditional four movement work for symphony, save that it is the final movement. One of Maestro Jacobsen’s original concerns about this movement was the playability of the combination of pizzicatos and neighbor-tone finger-taps called for in the string parts. Because it may not be easy to be played well in time it could eat up precious rehearsal time. What actually ensued was that it did not prove a problem at all. This may be because the orchestra was alerted to the challenge before hand and practiced it. The first half of the principal theme appears in the high woodwinds @A with the second half spoken by the clarinet, trombones and violas @B (0:14). Rehearsal C introduces the second theme which ends at the string pizzicato/tap neighbor tone figure. The first half of the main theme is a solo in the low register of the tuba (1:08). I was thinking of principal Bob Carpenter‘s superb low register when I created the short passage. Not every tuba player can play that double low C with such volume and musicality! @ E, we reach a thematic mixture and development section beginning with a virtuosic flute passage (1:20) written for principal Colleen Blagov who performed it brilliantly even at the rapid tempo presented. Themes continue to fragment, repeat and mix, reaching a high point of tension @H and resolving with the second theme at b59. I moves back into the repetition of simpler material providing gives the listener a bit of rest before the piece winds up for its finale. Theme A is restated at K with an extension of the 16th note figure of its last bar (G.A.E.F#) which becomes the motor for a last development before the noble final statement of Theme B from the horn section and full orchestra. Like Salieri tells Mozart in the movie Amadeus, I made sure the audience knew it was an ending by having fragments from each section being stated a full volume all supported by 6 bars of a big traditional G major chord and stinger. Maestro Jacobsen told the orchestra “that’s an ending!”. Though not at all a normal music ending for a modern symphony, the entire work needed such a solid ending to feel finished and complete. Though the symphony ended here for the premiere, this is not intended to be the last movement. It is a third movement scherzo, common to the normally 4 movement form. The fourth movement has not been composed. Yet. World Premiere: March 26, 2016 by the Orlando Philharmonic Orchestra, conducted by Eric Jacobsen. Bob Car Performing Arts Theater 400 W. Livingston Ave., Orlando, Florida.